It’s sometimes good to be injured because the time you might normally spend racing or training can be devoted to other things. Recently, I crashed my bike during The Gauntlet Half Iron Distance Triathlon at Hever Castle. I broke my rib which means that today, instead of running the lovely Downs Link Ultra, as I did last year, I am sat in my mother-in-law’s garden in Dorset, writing a race report for the Vanguard Way Marathon which took place way back at the beginning of August and was my 50th marathon. Organised by the same people who do the Richmond Park Marathon, The Vanguard Way Marathon touts itself as the beautiful marathon. It starts, however, in the less than beautiful South Croydon, London! I had an early start in my toy electric car to get up to London and charge on the way at Pease Pottage. I arrived in good time though at Lloyd Park, where Gareth the Race Director was setting up. I met up with one or two people whom I recognised and know from other races. You can’t fail to keep seeing the same people when you turn up at as many races as I do during the year. Prior to running the Vanguard Way Marathon I had done very little research on the race and came into it fairly blind. The problem with running so many races week after week is that you tend to get a little complacent. “It’s only a marathon” I say, with rather too much confidence. The race started just outside the sports centre at Lloyd Park and headed off east through Coombe Park and on to Selsdon Woods. This is where the fun really began. We were about 4 miles in when a group of us suddenly realised we weren’t coming across any way markers. The route had been regularly lined with tape or orange spray but we hadn’t seen any for a while. We all got our phones out and started looking at various maps. We consulted our Garmins which were indeed showing us way off course. Oh dear. We eventually chose a path and just kept running. After a good 10 minutes or so we found the route again, but by the time we saw Gareth at Farleigh Golf Club we knew we had run at least an extra mile and we were way behind the front runners. Still, it’s all part of the fun. Getting out of London involved some road crossing and just one or two not so picturesque paths. But it’s definitely worth it once you get beyond that. There is an aid station at what should have been 10k but was about 12-13k for some of us. After that, the countryside starts to open out. You do have to keep your eyes on the route as it’s not going to hold your hand all the way. There are certainly two or three sections where, if you don’t have your wits about you, you could easily get lost….again. Up to this point there hadn’t really been any climbing or descending of note. That was about to change. 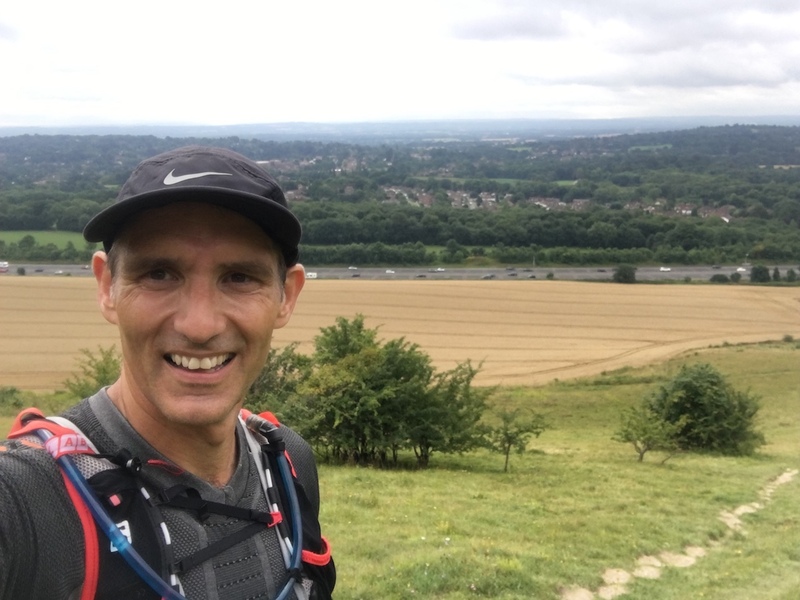 After a rather random run across a field we came to a very steep, but pretty descent through colourful yellow and mauve flowers down towards Warren Barn Farm, followed by a short steep ascent which levelled out to become a very long gradual climb known, I think, as Botley Hill. Arriving at the top of Botley Hill we were greeted with the most spectacular view, south, across Surrey. The sprawling M25 motorway was way below us down an incredibly steep hill known as Whistlers Steep. It was at this point I realised I was going to be coming back the same way. 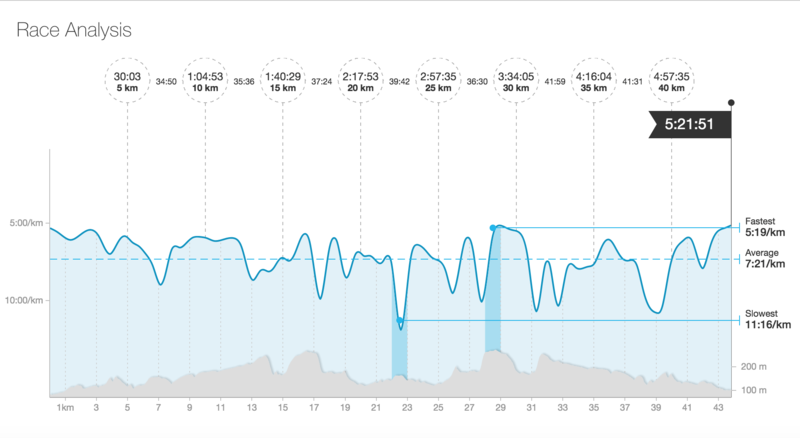 The Vanguard Way Marathon is essentially out for 13.1 and back again. At the foot of the hill the lead runner passed me on his way back. This is where the Vanguard Way briefly joins the North Downs Way for a couple of miles. I still had three miles to go to the turn point. Another gentle downhill brought us to the bridge. Crossing the M25 at Titsey Wood, it was then only a mile or so to the turn point and the halfway aid station. The worrying thing was that it had taken around two and a half hours to get to half way, and although that included the detour, it also included some big downhills which we would have to climb on the way back. This was not going to be a fast marathon! The most worrying thing was that the sun was now very hot indeed and Whisters Steep hill was very exposed. It was such a slow, grinding walk back up that hill. There was no power hiking at all. I stopped a few times to look back and catch my breath. I enjoyed the long gradual descent through Whistlers Wood and out into the open with the gorgeous view over the hills. At this point, I came up behind a runner on a short road section. He said he was struggling with a twisted ankle. He informed me it was easier to carry on on the road and cut through Warren Barn Farm than to go the prescribed route. I don’t know why I trusted him because looking at my Strava map later, it was neither shorter, quicker or any easier. In fact, it was longer and involved more of a climb! Anyway, we got to the foot of the pretty hill with the yellow and mauve flowers and I forged ahead, leaving said struggling twisted-ankle runner behind. I ran on through various fields and along numerous paths for 3 or 4 miles, only to come out just before the final aid station and see the self-same chap running from a different direction! Now, I’m not one for casting aspersions, but it did seem a little odd that I thought I was quite a way ahead of him, he was supposedly struggling, and then he suddenly appears from a different direction. Look, it’s not the Olympics and I don’t really care….although I guess I care enough to mention it here. Perhaps, because he was struggling, he had decided to drop out of the race and was just taking the easiest, shortest route back to the finish. If I’m honest though, looking on a map, I can’t see where he could have taken a shortcut. So, on I went past the golf course and through the various woods towards the finish. I arrived at the point where we had rejoined the correct route on the way out and made sure I watched carefully for the markers. When I got to where we had gone wrong initially it was clear that we had indeed followed the route markers. So someone had either put them in the wrong place by mistake or the route had been sabotaged. Coming back I was becoming more and more fatigued. The heat and the hills were a cruel combination and seeing the time ticking away was a little disheartening. Eventually though, Lloyd Park was in sight. I had been filming so I had been stopping at various points en route to film. Our injured friend had had a miraculous recovery and crept ahead in the final miles. However, approaching the finish we were running together again and blow me, he only starts racing me to the finish!! My idea was that I would film us both crossing the line together….you know, shared struggle, brothers in arms, finish as equals. Oh no, not this chap. He was sprinting for the line and in the end, I let him go. Now, had this been any other race I would be completely magnanimous in defeat. But I was slightly irked that 2 hours ago he was telling me how he had sprained his ankle and then it appeared he’d miraculously appeared from nowhere. Just a bit odd I thought. Anyway, I was very happy to finish and looking at my watch it was, without a doubt, the slowest marathon I have ever completed. Five hours and twenty minutes. i can’t really explain it other than to say that I ran close to 28 miles, the hills were steep and the sun was hot. However, that’s the case with lots of marathons I’ve done. Giant’s Head in Dorset, Purbeck Marathon, Three Forts Challenge. All are over marathon distance and have big, hurty hills, but I managed them in well under 5 hours. Perhaps it was just a bad day at the office, or maybe the Vanguard Way Marathon is just very, very tough. Whilst I will agree that there are some very beautiful parts of the Vanguard Way Marathon course, I would certainly place it behind the marathons I’ve mentioned above, and the Beachy Head Marathon for scenic beauty. That’s not to say you shouldn’t do it. You should. It’s well worth the experience. This is a marathon for runners who don’t want fancy aid stations or huge arrows and signs making absolutely sure you’re going the right way. There’s none of that. If you can’t find the way, or if you get lost, tough. Deal with it and find a solution. Climbing that hill with the M25 behind is comparable with the steepest hills I have climbed in a marathon and then there’s another one not too long after! After 50 marathons, running The Vanguard Way Marathon has taught me not to be over confident about the marathon distance. Be nervous. Be ready, or it will find you out, and it will beat you, as it did me today. Thanks to Gareth and his team for organising the race. I certainly enjoyed the mobile cafe serving latte and fresh fruit smoothies at the end. We were also able to use the shower facilities at the sports centre which was really great. 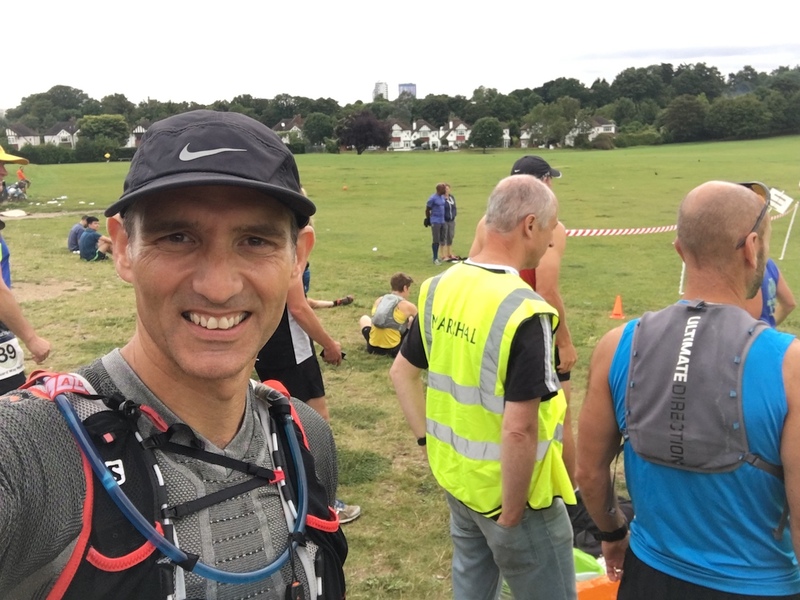 Gareth also organises the Richmond Park Marathon, one of my favourite marathons, so go watch that video here and while you’re entering the Vanguard Way Marathon you may as well put your name down for Richmond Park too!